The TWiVirions reveal bacteriophage genes that control eukaryotic reproduction, and the biochemical basis for increased Ebolavirus glycoprotein activity during the recent outbreak. The TWiVome reveal the first eukaryotic genes in a bacteriophage of Wolbachia, and how DNA tumor virus oncogenes antagonize sensing of cytoplasmic DNA by the cell. TWiV 388: What could possibly go wrong? Preprint servers, the structure of an antibody bound to Zika virus, blocking Zika virus replication in mosquitoes with Wolbachia, and killing carp in Australia with a herpesvirus are topics of this episode hosted by Vincent, Dickson, Alan, and Kathy. Vincent visits Vanderbilt University and meets up with Seth, Jim, and Mark to talk about their work on a virus of Wolbachia, anti-viral antibodies, and coronaviruses. Vincent, Alan, and Rich review ten compelling virology stories of 2011. 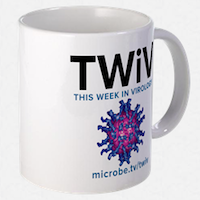 The complete TWiV gang discusses the use of Wolbachia to control mosquito-borne infections. Vincent, Alan, Rich and Marc discuss the finding that a limited number of incoming herpesviral genomes can replicate and express in a cell, and controlling viral replication in Aedes aegypti with a Wolbachia symbiont.